OUD-BEIJERLAND, The Netherlands, October 9th – At this year’s Elmia Nordic Rail, starting the 10th of October in Jönköping, KONI further connects with the Scandinavian and Russian markets and highlights its patented Frequency Selective Damping solutions which result in a track friendlier bogie. KONI will be exhibiting at the Elmia Nordic Rail event in Jönköping, Sweden, and welcomes visitors at its stand no. B07:79, in Hall B. KONI’s patented innovative FSD technology is highlighted at the show, which has proven to reduce wheel-track force demonstrably. This leads to less wear and tear on both tracks and wheels and thus reduces the maintenance and replacement costs. Elmia Nordic Rail is the only dedicated railway exhibition in Scandinavia. Elmia Nordic Rail is the industry´s most important meeting-place for customers, representatives and other stakeholders in the business. The fair has been held since 1995 and is arranged every two years. Since 2007 Elmia Future Transport is arranged at the same time. The fairs have essentially the same structure and both have a focus on the future of transport and intermodal solutions. In 2015, the event attracted 4125 visitors and over 340 exhibitors from 19 countries were present. 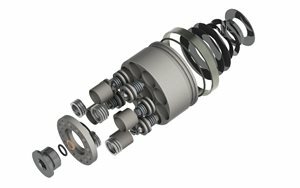 KONI is a market leader for various railway shock absorbing solutions for several years. The recognized KONI rail product is considered the most homologated brand. Hence, it is applied basically everywhere in the world. All over EMEA, the America’s and the APAC operators experience the pleasure of using KONI’s durable and reliable products with the highest RAMS factor.